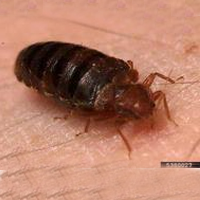 Use our pictures and descriptions below to identify the pest that’s bugging you, and then call Cayce Exterminating at 803-796-BUGS! 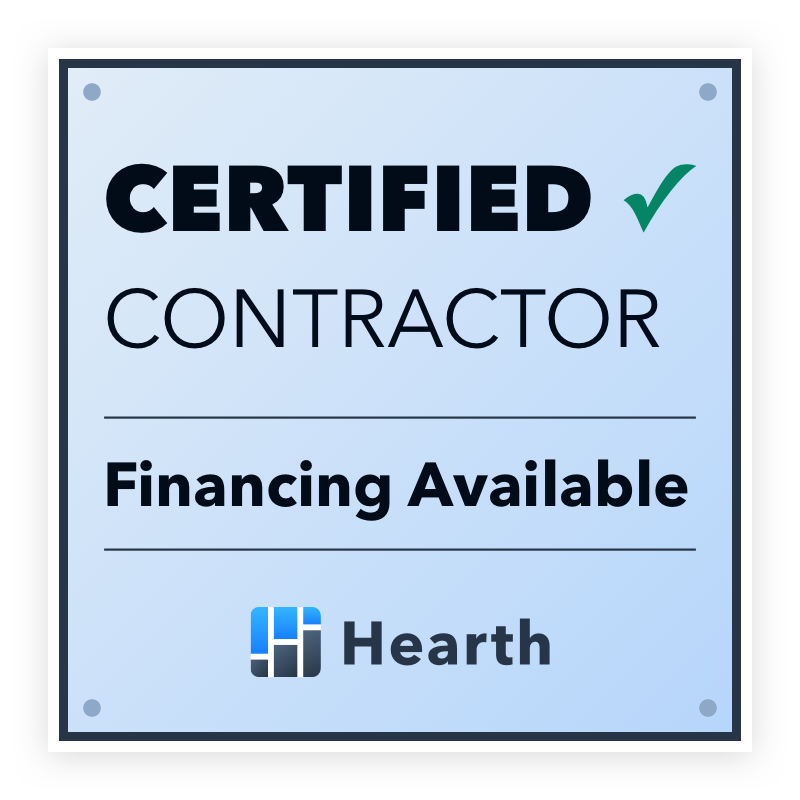 By identifying the bug before we send out our pest control crew, we can give you a better price estimate and prepare our pest control experts. 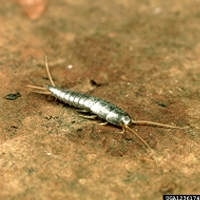 Silvery to gun metal, 1/2 to 3/4 inch, normally hide during the day and can infest any area or structure. 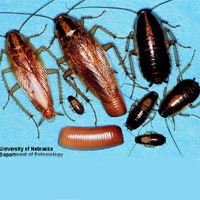 Pale brown, reddish brown to black, 1/4 to 1 inch, active at night, hide in moist, shady areas. 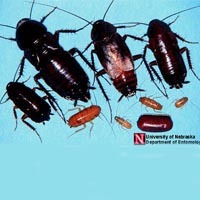 Reddish to dark brown, 1 3/8 to 2 1/8 inch, commonly known as "waterbugs". 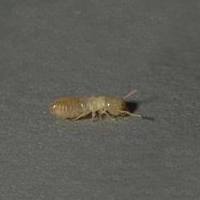 Brown to tan, 1/2 to 5/8 inch, common in kitchens and baths. 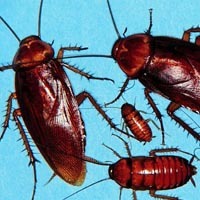 Shiny black to dark reddish brown, 1 to 1 1/4 inch, commonly called "sewar roach". 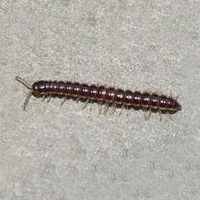 Light brown to brown, about half an inch long, prefer warmer areas of a structure. 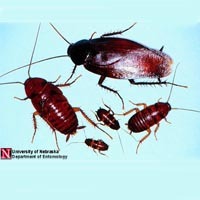 Shiny brownish black to dark mahogany, 1 to 1 1/4 inch, common outdoors in protected, moist, dark and warm areas. Good fliers and attracted to light. 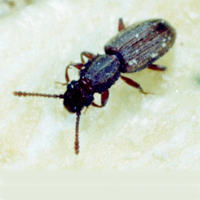 Blackish, brownish or red/orange, active at night and seek areas of high moisture. 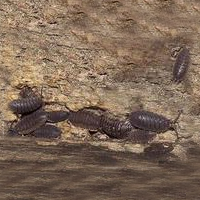 Slate grey, 1/4 to 5/8 inch, commonly called "rolly-pollies". 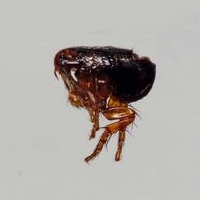 Brown, 1/8 inch, found in cereals, bread, nuts, dried fruits and many other products. 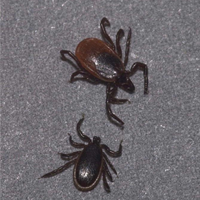 Red to reddish brown, 3/16 inch, harbor in cracks and crevices and feed at night, found in mattresses, box springs, furniture, etc. 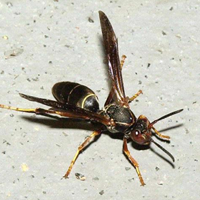 Yellowish brown to tan, 2 1/4 to 2 1/2 inches, sting comparable to a wasp or bee sting. 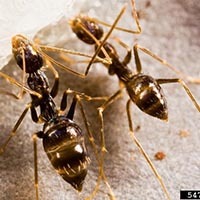 Brownish black to black, 1/8 inch, jumping insects, blood feeders that may transmit disese. Reddish brown, grey-blue or olive when engorged, can transmit disease. Dark brown to black, carriers of many diseases and heartworms. Tan to dark brown with a darker fiddle-shaped marking on dorsum (top behind eyes). 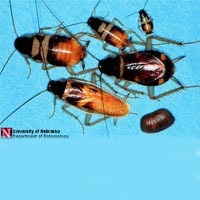 Inside, normally found in undisturbed areas such as boxes, shoes or below tables. Bites to humans can be dangerous. 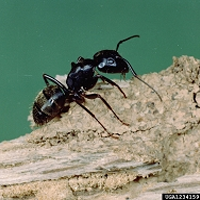 Typically black with reddish hourglass marking on abdomen. 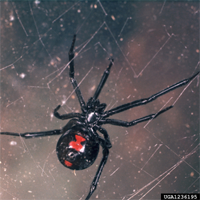 Inside, normally found in seldom-used areas of the garage, basements, and crawlspaces. Bites to humans can be dangerous, especially small children. 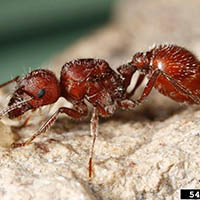 Brownish with yellow or reddish markings, 5/8 to 3/4 inches long, normally builds a comb nest in any protected location. 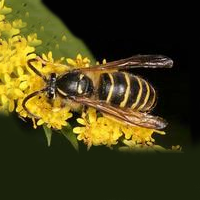 Yellow and black, 3/8 to 5/8 inch, mostly ground nesting but may build an aerial nest in shrubs or on buildings. 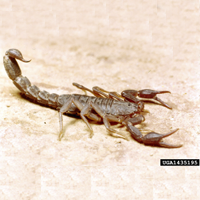 Orangish-brown to black with body covered with pale hairs, 1/2 to 5/8 inch, are not aggressive and will attack only when threatened. Live removal is preferred but not always an option. Black with white pattern on most of the face, 5/8 to 3/4 inch. Built of chewed cellulose material, can be constructed in trees, shrubs and on buildings, up to 14 inches in diameter and over 24 inches in length. 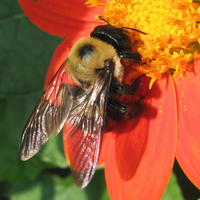 Black with yellow markings, 1/4 to 1 inch, beneficial insects due to pollination of many plant species. 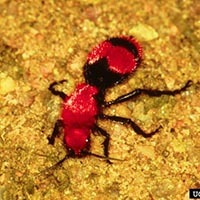 Actually a wasp but commonly mistaken for an ant. 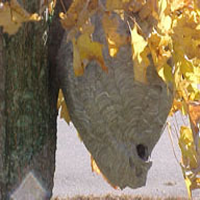 Females can sting. Normally found in yards and pastures cut occasionally inside of structures. 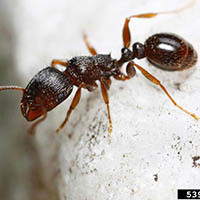 Normally built under stones, at the base of a tree, shrub or any undisturbed area. 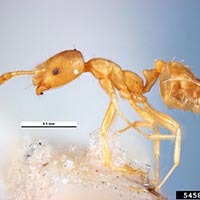 Head and thorax yellowish red and abdomen black, workers average 1/16 to 1/4 inch, inflict painful bites. 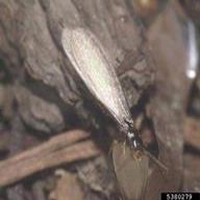 Light to dark brown, 1/16 inch long, inside usually nest near a moisture source such as sinks, potted plants, etc. Dark brown to black, 1/16 to 1/8 inch, prefer wall voids especially around hot water pipes and heaters, in crevices, around sinks, etc. 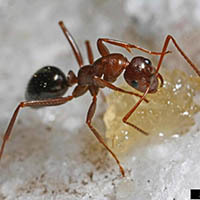 Worker harvester ants range from 1/4 to 1/2 of an inch in length. 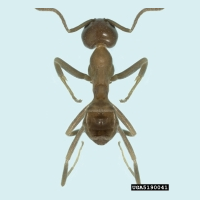 Different harvester ant species exhibit different colors, ranging from reddish-brown or yellow to black. 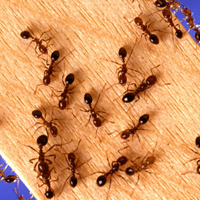 Pavement ants frequently vary in color from red brown to blackish-brown in appearance and are from 1/8” to. 1/4” in length. Dark brown to black, 1/8’-1/4”, rapid and erratic movements. 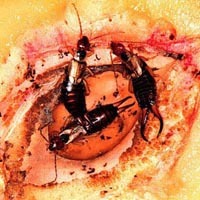 Highly adaptable living in both very and rather moist habitats. Yellow with reddish abdomen, 1/16”. 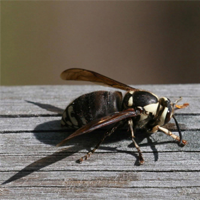 Nests in wood, wall voids, and baseboards. 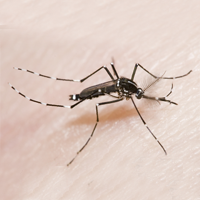 Prefer warm, humid areas near food and water. 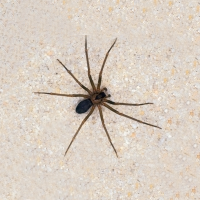 Light brown to dark brownish black, 1/8”, heart shaped abdomen. Nest outdoors in soil, leaves or wood; indoors in building voids, insulation and foam board. 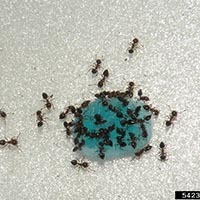 Off-white to almond color, 1/8 to 1/4 inch, does all of the work and damage for a colony. 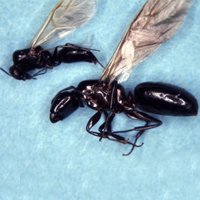 Black with 2 pairs of wings, 2 body segments, about 3/8 inch long with straight antenna, normally swarm in spring. 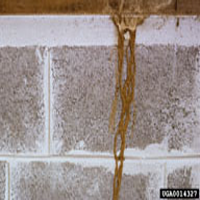 Mud tubes that act as highways between the colony and food sources. 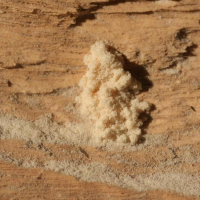 White, about 1 1/4 inch, can live in wood 12 to 15 years, evidence of activity include oval, ragged emergence holes, frass (fine sawdust) and "clicking" noise. 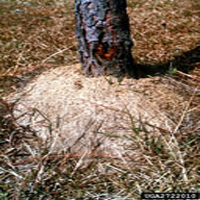 Small emergence holes and streaming frass (fine sawdust) are sings of an active infestation. Black, red/black, red or brown. Various sizes. 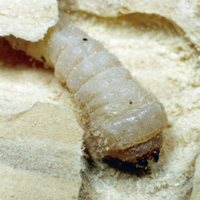 Normally infest decayed wood and expand into sound wood. Normally swarm from May until August. 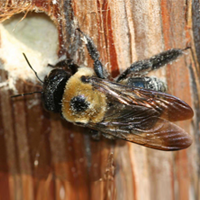 Resembles bumble bee except abdomen is black and shiny, about 1 inch long, normally bore holes in weathered and unpainted wood to lay eggs.